More or less every country in the world has a local delicacy, many of them look, from the outside, somewhat unusual. One of the most unusual for those new to the idea is the Swedish delicacy of Surströmming, a dish of fermented Baltic sea Herring. While it has been a part of the local Swedish cuisine since the 16th century and possibly earlier, to potential consumers from other countries, it has acquired something of an enigma status due to its reputation for overpowering odor. To produce Surströmming requires a minimum of 6 months fermenting of the Baltic herring, which is a smaller cousin of the more common Atlantic Herring. To ferment, the fish is placed in a weak brine solution and kept in barrels, while producers add in just enough salt to prevent the raw fish from rotting during the process. The result of this fermenting process is a somewhat acidic tasting fish, but its most famous and overriding characteristic is the pungent smell. Packaged in cans, the release of smell when a can is opened has been called the most overwhelming food smell in the world. Indeed, in Sweden it is more often than not eaten outside, and manufacturers usually recommend opening cans of Surströmming outside regardless of where it will be eaten. The upshot of this is the rise of the Surströmming Challenge, where people unused to the delicacy or its characteristic odor are invited to try the food for the first time. As a food, it is very different to a fish based meal that most people are used to, and overcoming the smell, especially on opening the can, does justify the use of challenge, it can be off-putting to the uninitiated. 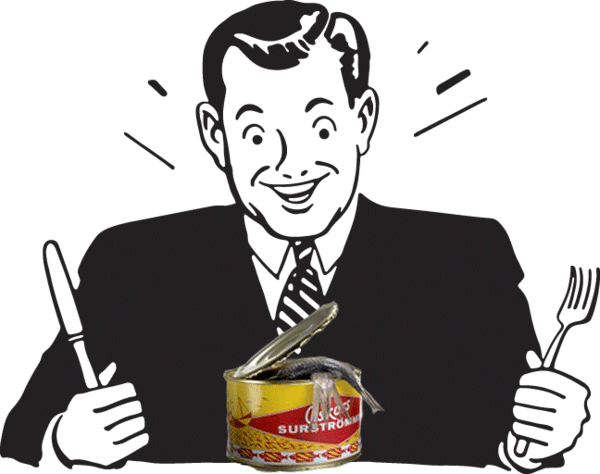 The Surströmming challenge has seen several videos of participants go viral, their reaction to the opening of a can of Surströmming in particular being popular, and this is usually contrasted with a native Swede calmly enjoying their own can of Surströmming. It is great entertainment, seeing people both be shocked and surprised at Surströmming, first the odor from the can and the way it looks in the brine, then on to how it tastes. Some find the slightly acidic nature of the dish a little too much, but many are surprised by the dish once they get past the initial shock of how it looks and smells when taken from the can and how much they like it.